Prepared to have your world rocked by these caramelized banana nut muffins. These are not your ordinary banana nut muffins. No sir-ee. 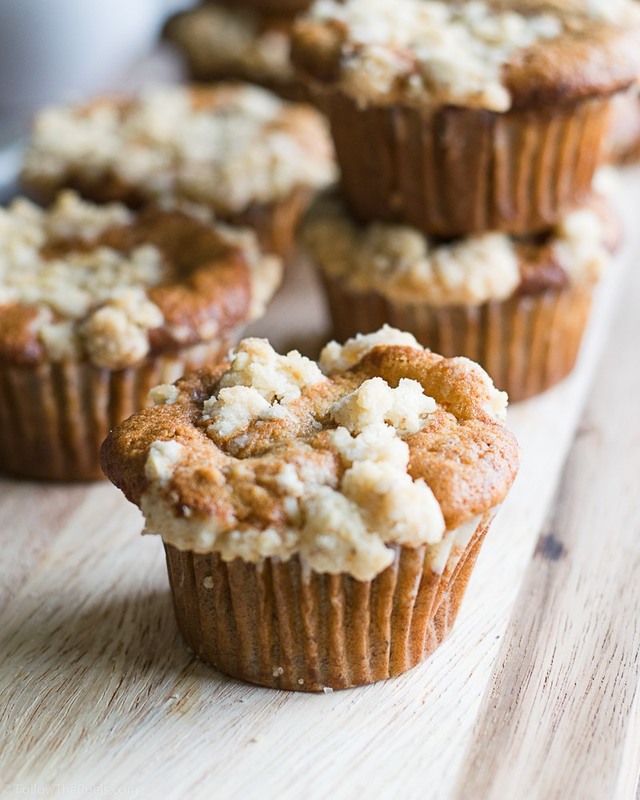 These banana nut muffins blow all others out of the water! It has to be the caramelized bananas that add a little extra sweetness and a much deeper flavor than a normal banana muffin. It's not a candy-sweet banana flavor. It's more of a rich banana flavor, if that makes sense. They are perfectly complimented by the nutty, slighly bitter walnuts that add an extra crunch factor. But of course, it all starts with caramelized bananas. To caramelize them, I just cut them in half lengthwise, sprinkled a little sugar on top, then set under the broiler for a minute or two, until they are nice and toasted. To make the muffin batter, I actually varied my normal go-to muffin batter recipe. Well, I should say that I varied the method. Most muffin recipes use a bread making method, where you add all the wet ingredients into the dry ingredients and then mix. For these, I used a cake batter method: cream butter and sugar, add eggs (and other fat), then flour and liquids. This helps keep the muffins nice and light. First, I creamed together the butter and sugars. Then I added the egg, vanilla, and Greek yogurt. To the butter mixture, I mixed in the half of the flour and then the milk. As for the nuts in these banana nut muffins, I used walnuts (but pecans would also be good). I crushed them into tiny pieces by placing them in a sandwich bag and smacking them with a rolling pin. It's a great stress reliever! Then I dumped the walnuts into the remaining flour and mixed that in with the rest of the batter. By mixing the nuts in with the flour, I ensure that the nuts are evenly dispersed throughout the muffins and don't sink to the bottom. Now for the good stuff. I gently mashed up the bananas and then folded them into the batter. After dividing the batter into the muffin tins I decided to add a little something extra. While these muffins would have been good on their own, who would turn down an extra crumb topping? Not me, that's who! To make the crumb topping, I combined some of the extra walnuts, flour, sugar, salt and some cold butter. Then I generously sprinkled the crumb topping on top of the muffins and popped them into the oven to bake. As these muffins bake they will fill your kitchen with the most wonderful smell! And once they come out of the oven, you will have a hard time waiting for them to cool before jumping in! I certainly didn't! I couldn't help but taste test one before it had a chance to cool. And then to make sure they were still good, I had another. And then the top off of another. Then I forced myself to stop because my coworkers might start to wonder why I was only bringing in 9 muffins and not 12. I will most certainly be making these muffins again the next time I had some leftover bananas (which is pretty much all the time). They are my new favorite banana recipe, and I am sure they will be yours, too! On a small baking sheet, line up bananas, cut side up. Sprinkle granulated sugar on top. Place under broiler for 2-4 minutes, or until golden brown and caramelized. Preheat oven to 350 degrees. In a large bowl, whisk together flour, baking soda, baking powder, and salt. Set aside. In a separate bowl, cream together butter and sugar until light and fluffy, about 1 minute. Add in egg, Greek yogurt, and vanilla and mix until combined. Pour half of the flour mixture into the butter mixture and mix until barely combined. Pour in milk and mix. Add walnuts to the remaining flour mixture and give them a toss. Then add to the rest of the batter and mix until combined. Gently mash the bananas with the back of a fork then fold into the muffin batter. Pour or spoon the batter into a prepared muffin tin, filling each tin about 3/4 of the way. Set aside and make the crumb topping. In a small bowl, whisk together the flour, sugar, walnuts, and salt. Then cut in the butter until it forms a crumb-like texture. Sprinkle the crumb topping on top of each muffin. Bake for 22-25 minutes until golden brown. Remove from oven and let cool for 5 minutes before transferring to a wire rack to cool.